Five “Farr-Out” Reasons to Love Farro + Three Great Recipes to Try! As you plan your next meal, why not try cooking with farro, the ancient grain with tremendous health benefits? Farro is a whole grain wheat, larger than barley grain and possessing a similar taste. It’s very simple to cook on a stovetop, also great when prepared in a rice maker or a pressure cooker. It’s often used as an alternative to rice or pasta for all the nutritious qualities it contains. 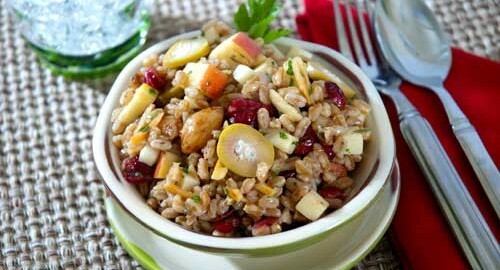 Farro is an excellent source of Vitamin B3, instrumental in improving your body’s metabolism. It’s also a great choice for your daily dose of Magnesium, which strengthens your blood pressure, bone strength, and overall cardiac health. 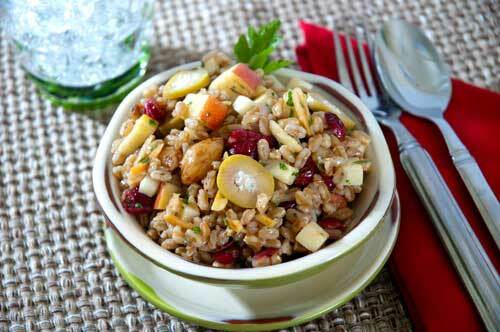 The anti-oxidants present in farro help prevent degenerative diseases and general cardiovascular problems. Yes, it’s true! 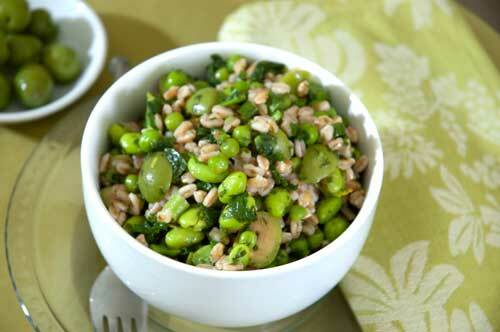 Farro contains about 15% protein, with 7 grams of protein found in a single serving! Not only is farro cholesterol-free, a full bowl has 8 grams of cholesterol-lowering fiber in it! An excellent choice for anyone watching their weight. The complex carbohydrates present in farro extend its digestion time, thus leaving you with more energy throughout the day. So now you know why you should be cooking with farro but you may be wondering how to cook with it? 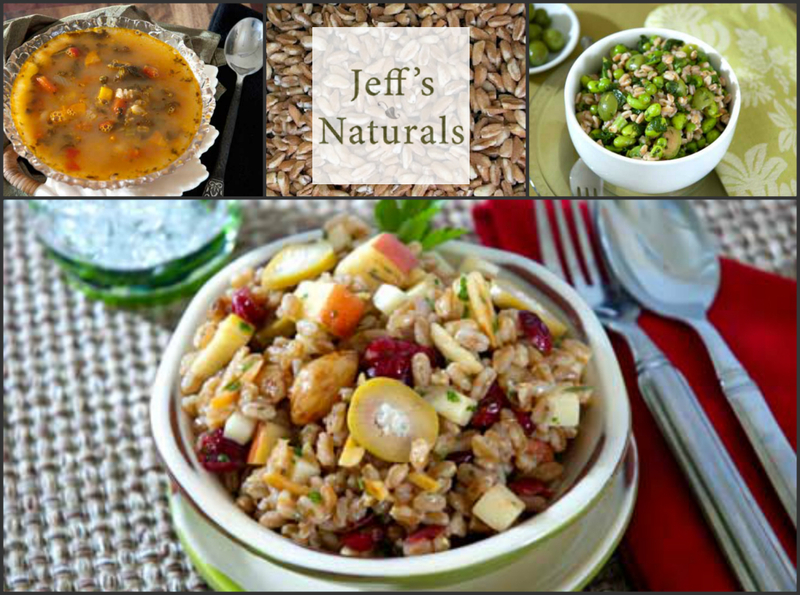 Consider these easy-to-make recipes below using Jeff’s Naturals line of certified non-GMO olives & peppers as an entry point into the delicious world of farro. In a large saucepan, bring salted water to a boil. Add farro and cook for 10-15 minutes or until tender. Drain and set aside. In a soup stockpot on medium heat, add olive oil, chopped shallot, carrot, and celery. Cook for 5 minutes until vegetables start to soften. Next add thyme sprigs, crushed garlic and kale. Stir for 2 minutes to wilt kale. Add the remaining ingredients with the reserved farro and let soup simmer 30 minutes. 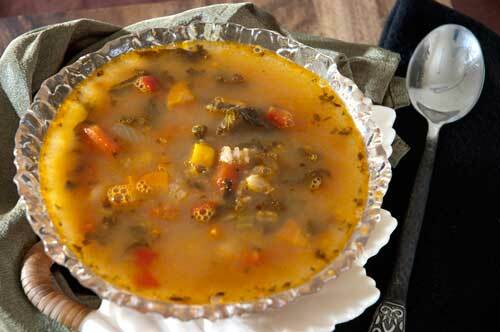 Serve hot with parmesan cheese on top and enjoy. Bring 6 cups of salted water to a boil. Add farro and cook uncovered for 10-15 minutes or until tender to bite. Farro has a natural bite and chewiness to it when it’s cooked through. Drain farro in a colander and set aside until slightly cooled. In the meantime, in a large mixing bowl, add the edamame, peas, broccolini, green onions, olives, olive oil, lemon juice and zest. Add farro to large mixing bowl and toss all ingredients together. Add the herbs, season with salt and pepper to taste and serve! Chefs Note: Feel free to play with this recipe and use any vegetable or herb in season. Asparagus, green beans, thyme or basil would all be wonderful. It will taste the best when the produce is the freshest! Bring 6 cups of water to a boil and add farro. Let cook about 10 minutes until tender to bite. Drain farro in a colander and set aside. While faro is cooking, add the minced shallot, balsamic, olive oil, parsley with some salt and pepper to taste, in a large mixing bowl. Add the cooked faro and mix to coat. Add the rest of the ingredients and stir to combine. Great served room temp or cold. For more delicious and healthy recipes head on over to our Recipes page.